Shirley Price Aromatherapy Ltd - France What we cant convey in this picture is the 'sound' of the Lavender. The field is alive with the noise of honeybees working. 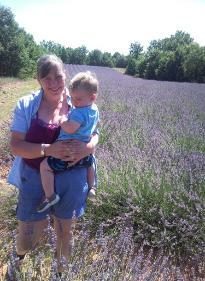 What we cant convey in this picture is the 'sound' of the Lavender. The field is alive with the noise of honeybees working. France is an important source of essential oils, not only mainland France but those parts of the world where french farmers have been and are active in North Africa and Madagascor. A number of french cooperatives source oils organic oils in particular from cooperative farms around the world while providing central warehousing and quality control. Aromatherapy forms only 10% of their output but it remains an important market. Shirley Price provides vital feedback through the practical use of oils day to day by professional therapists working at the highest level of aromatherapy. We are very proud to be asked to work with these cooperatives and have many years trading history together. France of course remains the source of much of the worlds Lavender with many producers devoted to producing Lavender Angustifolia of the highest quality. Most of the lavender produced in France is Lavandin, a cloned cousin of true lavender. Lavandin has been accorded relatively few therapeutic properties by the congress of Grasse, a group of leading aromatherapy authors and practicioners. Therapists require Lavender from Lavender Angustifolia Miller.